« Reply #285 on: December 01, 2008, 03:30:47 PM » by JayBee That's how I roll. The VF-22 hovers in battroid mode, firing the buster rifles at some poor ground-punders in the tanks below it. As they explode, she returns the rifles to their hardpoints. Hey, Shara.... I know it's easier to hit 'em that way, but I thought you were better than that. She brings her right arm up and aims it straight at the VF-25. A laser pulse flashes out. Debris from a fighter plane behind Jaybee pelts the back of his battroid. "Then pay less attention to me and more to them." The VF-25 fires it's rifle at a Barrellion taking aim at the pair. See? Wait, when did a Barrellion come over here? Pay more attention to the enemy. The VF-22 sends a few missiles after an incoming pair of Guarlions. "Right, whatever. I'm ready to go for that Rhinoceros, personally." Yeah, the boss is probably there. Hence the wall of Barrellions between us and it. "You aren't... afraid of them, are you?" I'll keep the mechs busy, you go for the tank. The two VFs shift to fighter mode and rocket towards the Barrrelions. Jaybee releases blasts the one in the center with missiles, and Shara flies through the explosion and out the other side. The Barrelion pilots seem unsure who to target, as their guns wobble uncertainly. Oh, no. You boys don't get a choice. Shifting to battroid mode, the VF-25 dives in and drives his knife through a Barrelion's secondary beam cannon, disabling the weapon. The flying guns all start locking onto Jay as Shara continues on, ignored. Yeah, that's right! Avenge your fallen ally! The VF-25 spins to the right and boosts upwards, firing the super packs to get out of the way FAST, and the first volley of high-velocity railgun slugs comes, tearing through the space the battroid occupied a fraction of a second ago, the shockwave jostling the lightly-built VF. Slapping a switch, Jaybee triggers... the CD player, of course. Information High rolls across the battlefield on an open comm channel. You six REALLY think you can take me? Gunpod fire pelts against the armor of one Barrelion. You may have some luck against a big slow target like a battleship, but THIS is a totally different beast! Beam fire slices through the air as Jaybee sends his VF dancing through the sky to shake target locks. THAT'S more like it! HIT ME IF YOU CAN! Hey, Shara... make it fast. As the battle rages on above, a few DC mechs linger in the bunker. Lion Pilot: We just go the call, everyone pull back and provide back up. With that the Lions rush towards topside, unaware that a camera that had been following them slowly turns off. ?? ?4: Hey Hey! Looks like they left. ?? ?2: Bout time, those bastards. Kame, how's topside? ?? ?3: Sempai, looks like Ashy-boy is out there with some reinforcements. ?? ?1: Ash-sama must of found the Blue wings. ?? ?4: Really? Cool, I wonder if can get their autographs? ?? ?2: Ryuta don't worry bout that. Kame tell me...Did he do a Hisstastu attack….A Hisstastu Attack! ?? ?3: Sempai….your properties really need to be fixed. ?? ?1: Kame, You said the DC forces where out of the main bay correct? ?? ?2: Oi oi, Kuma what are you planning? ?? ?1: I'm going to go out there and help Ash-sama. (pauses) In Outlaw-sama's gift. « Reply #287 on: December 01, 2008, 10:35:53 PM » by JayBee That's how I roll. Jaybee acquires a missile lock, then mvoes to evade an object coming towards him. It explodes, flooding the air with mylar particles, scrambling his radar and targeting lasers. Chaff? You sent CHAFF at me? Flipping all his targeting sensors off, the VF-25 pilot flicks through the air, aiming his gunpod by eye straight down the railgun barrel of the foolish fool that launched countermeasures foolishly. WHAT KIND OF RAW RECRUIT DO YOU TAKE ME FOR? As he squeezes the trigger, slugs fly hard and fast, tearing down teh barrel, smashing electromagnetic rails, and ultimately ripping through the gun's breech and smashing the vulnerable innards. Hey, Shara. What's taking so long? The Sturmvogel hovers in the air, depleted buster rifles smoking as they're returned to their charge points. The Rhinoceros is clearly damaged, but showing no signs of depelted capacity or imminent system failure. The battroid does a mid-air backflip, slashing a pair of missiles out of the air with beam sabers while hanging upside down. "I'm not the one that put enough armor for a whole fleet on one vehicle! It takes TIME to burn through this mess! What I wouldn't give for a reaction missile right now." Hey, this is a recapture mission, not scorched earth! Derek: You guys should just try siccing Ash on it. I bet that Grungust would tear straight through. *Looks around and notices he's surrounded* And a few more free kills for m--*Goes to fire his beam gun, only to realize it's empty*--Oh. Well, that makes things a little difficult. Derek: *Shrugs and drops the busted railgun* Or not. I have to remember to thank Gai for that idea when we get back. « Reply #289 on: December 02, 2008, 05:49:00 PM » by JayBee That's how I roll. Panels flip open on the VF-25 as Jaybee prepares for his final attack. The VF-25 launches all it's missiles in one attack. The chaff mostly dispersed, they have little difficulty locking on to the surviving Barrelions, and all 3 explode in a quite satisfying manner. What? You thought I'd added something fancier? I'm not customizing the VF-25. It'd ruin the point of gathering performance data before the final rollout. Upon hearing his name over the open comm, Ash turns his attention to the rhino. Soaring past Jay and Shara he waves form his cockpit, switch from Wing Gust to battle mode. Although the transformation takes a bit longer then normal. Ash : Need to oil this thing when I get back. (crosses his arms at looks at the Rhino) Well, you guys did make a good number of dents on this thing. I'll just slice her up for you guys. Calamity Blade! Ash waits for the blade to slide out of it's holster only to have a few lions rush at 21. 21 quickly hops backwards. Ash: Guess I'll have to show you guys something different. BREAK CROSS!!! With that 21's right arm opens up and starts dropping ninjas stars into the left hand as fast as Ash can throw them. Slicing up the lions and exploding on contact. Ash: Didn’t know I had exploding shuriken did ya? (turns his attention back the to Rhino) Alright Jay I'm going to peel the armor right off this thing for you. Alright abiou, Showtime! Pulling back on a red lever in the cockpit, the Grungust digs it's feet into the ground and it slams it's fist together before pulling them to it's sides. The chest plate slowly opens up as the turbines on its shoulder's pull in raw energy. Ash: 50%, 80%, 100% (grabs hold of a white joystick as it pops up) Here I go… FINAL BEAM!!!!!!! 21 let's loose a blast of burning white energy at the Rhino, blasting off pieces of it's armor. The chest plates slowly close afterwards, smoking a little. Ash: Hum…Might have to change that voice command to Mega smasher instead. (looks upward) Jay, Shara, your open can of DC is served. « Reply #291 on: December 02, 2008, 07:38:58 PM » by JayBee That's how I roll. Thanks! Looks like that sardine can's open and ready for eating now. Shara, mind if I finish the job? "Be my guest. I think there's some Lions feeling neglected over here." Shara launches a laser through one's head module as she speaks. Dodging anti-aircraft fire, Jaybee flies up in fighter mode, shifts to battroid as he gets close, crams the muzzle of his gunpod into a sizable gap in the armor and empties his clip into the Rhinoceros. He boosts back rapidly as mechanical grinding noises and electrical sparks start issuing forth, and after a few seconds the tank goes up in a large explosion. So... we killed the commander. Second wave incoming or shameless retreat? After seeing their tank go up like a firecracker on the 4th of July the few remaining Guarlions, and a Barrelion, high tail it for the bunker. Guarlion Captain: (As the mechs rush into the bunker) Alright, we'll lock ourselves in here to reinforcements arrive. Barrelion, stay outside the main door and don't stop firing. The Barrelion turns around as the main door closes, getting a few puzzled looks from the DC forces. Lion Pilot: Sir….did you do that? A hush falls over the DC Forces, as the door behind them slowly rises up. The door they had been trying to break into for a while. With a heavy footstep a single mech walks out. Moment's later the main door of the bunker opens up with lion parts being tossed outside like cheap junk. The Barrelion turns around as this (http://i108.photobucket.com/albums/n28/TuxedoK/ZakuAXe.jpg) walks out from the bunker. Barrelion Pilot: A Zaku….A stupid zaku!!! You'll pay for doing that to the Captain. ?? ?1: My strength will make you cry…. (the heat axe in it's hands starts to glow yellow) Wipe your tears with this. The Barrelion beings to open fire on the yellow Zaku as it simple tosses it's heat axe into the air, then jumping after it till it catches it in midair. Then slices down full force on the Barrelion, slicing it in half as it lands. The smoke clears, and the zaku rests the axe on it's shoulder. Ash: (looks at the scene and laughs) Kintaros, great timing as usual. « Reply #293 on: December 03, 2008, 01:18:58 AM » by JayBee That's how I roll. Jaybee looks at the carnage in and around the bunker, and whistles. Shara: "I'm still surprised they left a single Barrelion out there to guard the door after Jay's slaughter, but... it didn't really matter." Yeah. I didn't even have time to get properly insulted. Impressive work there, especially for a Zaku. I'm guessing the mods on that go quite a bit beyond the obvious cosmetic ones? Derek: Oh, I trick out a GM, and you consider it a shame. He mods a Zaku so it has a finisher, and it's impressive. There's just no pleasing you people. *Looks over at Fuyume and Cybuster* You guys agree with me, right? Fuyume: *If the Fei-Yen had eyes, they'd have stars for pupils* Kyaaaaaaaaaa~! That was so COOL!!!! You were sooooooo awesome, Zaku-san! Cybuster: I hate to say it D, but that was pretty damn sweet to watch. I'm surprised, though. We usually shout the attack names either before or during the move, not after. Derek:.....*Turns towards the Tsubasa* Alexis? Haruka? You guys agree with me, don't you? Alexis: *Over the comm* Kyaaaaaaaaaa~! It's so COOL! 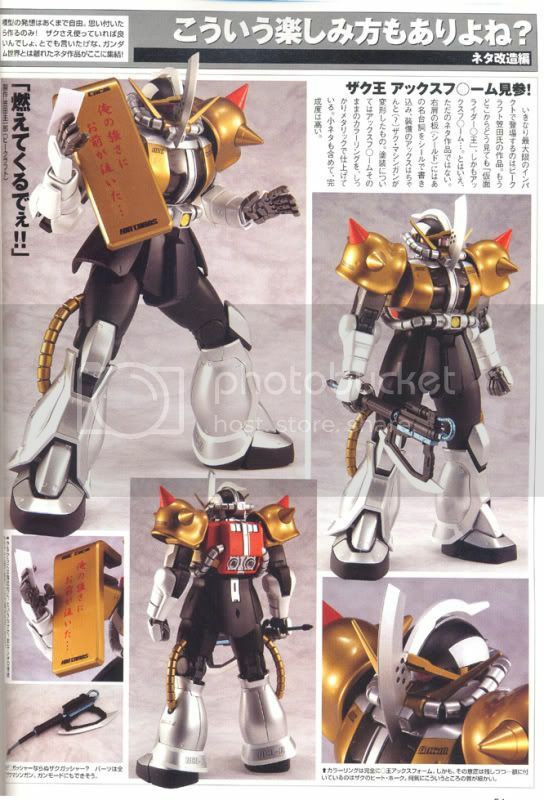 You look sooooooo awesome, Zaku-san! Haruka: Give it up Derek, you're not winning this one. Alexis: *An alarm goes off over the comm* Incoming enemy units from the west, approaching fast! Counting thirty....no, forty! Derek: --Blow the living crap out of these guys for being in the wrong place at the wrong frelling time. *Turns to face the oncoming force* Bring it on you....*Gets a good look at the enemy forces approaching*....Am I seeing things, or are the DC forces getting backed up by GESPENSTS?!?! Masaki:.......Yeah, okay, that's screwed up. Who the hell's driving those things? Haruka: I heard something about the Hagane being attacked by a force using modified Gespenst Mk-IIs, but I didn't expect any of them to come our way. Derek: Whatever the deal is, I don't care. They're picking a fight with the wrong crowd. Masaki! Fuyume! *Pulls out a beam saber* Let's send these ghosts back to the graveyard! Tech: Captain Bright I am detecting DC units heading towards our position. Bright: How long and how many? Tech: I'd say 10-20 minutes away and I'm detecting at least 800 machines. Bright: Just our luck, the DC decides to attack us here when the Aoi Tsubasa is away. Tell all the pilots to prep for battle. « Reply #296 on: December 03, 2008, 09:24:21 PM » by Ianator is Gaius Baltar. Hmm, what's this? That's a lot of ghosts that want to play. Where's my R-3 when I need it? Astonage, are those reinforcements to the Strike's frame done? Right on time. Load 'er up. Pattern: Super Strike. "I figured as much. Just be careful, okay?" Kintaros: (looks over at the Gespents) Ash-sama are those friends of yours too? Ash: No Kintaros. Gespent's that fly are never good, unless they are excluding a Gespent kick. (types a few commands on his keyboard) Alright, Kin you listen to Derek and the others. (points towards Derek's Gm and the Aoi Tsubasa) I'm going to go get the others. Kintaros: (The Zaku Axe slaps the sides of it's face in approval) Hai. Kintaros storms off towards the others with his axe on his shoulder. Ash quickly moves his Grungust back into his bunker, closing the door behind him. A beam a light shoots out form one of the cameras in the bunker hitting the bracelet. The lifeless displace screen slowly returns to life. Four tiny square appears on the screen, one red, one blue and one purple. The last square glows faintly yellow. Ash smiles as he lowers his arm. Urataros: Ashy-boy you gave us quiet a scare. Momotaros: Oi, enough of the welcome backs. Can't let Kuma hog all the fun. Ash: Momo's right. After we rearm 21, we'll get back up there and help Kin. Urataros: Small problem with that…. Ryutaros: Those mean guys broke the rearm station. Ash: (sighs) Damn. I guess I could just go out there with the blade and knuckle. Urataros: Or you could use that. Ash: (looks over at the side bay) That. (thinks for a second) But I didn't finish tuning it up. Momotaross: Who cares, slap on the goggles and let's take it out for a spin. Momotaros: About time. Let's show them a true Climax. « Reply #298 on: December 03, 2008, 09:56:25 PM » by JayBee That's how I roll. Hey, Derek. I didn't say a tricked-out GM was a shame. I said you stealing our kills with it was. We haven't had time to be bothered by the Zaku yet. Speakin' of time... think we have enough to reload, Shara? "Let's just break open the special crates." Jaybee and Shara land in the hanger, leap out, and stride over to a pair of large shipping crates half-hidden behind the cases of ammo and spare parts scattered about. They key in the security codes and the doors slide up, revealing twin walls of styrofoam that immediately collapses. I told them not to use peanuts! "At least the cockpits are clear." Shara climbs into her half-exposed vehicle as Jaybee grabs a ladder and hoists himself up to his own cockpit. As he opens the hatch and swings into the mech, Shara finishes her pre-launch checks, and her fighter comes to life with a dull roar and heads out, sending peanuts swirling in it's wake. "I'll be sure and save you some kills, slowpoke!" Jaybee shouts back, without looking up from the control panel in front of him. Thanks! I'll try not to pass your score too badly once I catch up! Computer online. Base diagnostics completed. Shipping restranits disengaged. Generator stable. Weapon safeties disengaged. There's a loud noise as several metal pins eject from the missile pods on the back and smack into the sides of the shipping crate before falling down into the sea of peanuts below. All systems green. Let's get this show on the road! The dark purple mech steps out of it's shipping container, and the foam kicked forward showers the deck as a cloud of particles rises up from the peanuts crushed beneath it's foot. A glow builds in the high-output thruster nozzles beneath the missile pods, the one major mod performed on the mech. Then a surge of energy rolls out, sending foam flying every which way as the machine launches forward at an almost reckless speed in pursuit of it's counterpart vehicle. Astonage is the V2 ready to go? Astonage: "The funnels haven't been recalibrated but, give us a minute and we'll get the Assault and Buster parts loaded." After this battle I'll get the calibration done. Astonage: "They're loaded, be careful out there." Victory 2 Assault Buster Launching!